Invisalign in Canton Can Straighten Your Teeth Discreetly! Have you been wondering about straightening your smile? For years, traditional braces have been your only option. 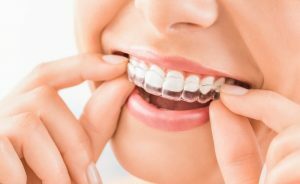 Kids look cute in metal braces with bright colors, but for adults, braces can cause self-consciousness and even make some people too embarrassed to smile. Thankfully, you now have a much better, more discreet option than ever before. Invisalign clear aligners offer you a way of straightening your teeth without the obviousness and inconvenience of traditional braces. Keep reading to learn how Invisalign in Canton can help you achieve a beautifully straight smile without anyone knowing! Invisalign treatment uses clear aligning trays that you wear to gradually straighten your teeth. These aligners are interchanged around every two weeks for a period of 6 to 8 months depending on how much your smile is misaligned. Your dentist will custom make your aligning trays based on your teeth and develop a treatment plan specific to you. Invisalign aligners are typically used for adults with mild to moderate misalignment. If you have more severe alignment issues, your cosmetic dentist may recommend that you get traditional braces instead. What Advantages Do Clear Aligners Have Over Traditional Braces? Traditional braces are very noticeable, especially on an adult. Invisalign aligning trays allow you to straighten your teeth without anyone knowing except the dentist. Their discreetness has made Invisalign treatment one of the most popular straightening methods today. Once traditional braces are put on a patient, they must stay in place until they are professionally removed. With Invisalign clear braces, you can remove the aligners for short periods of time. What’s more impressive is that the aligning trays never get caught or cut the inside of your mouth. Traditional braces are notorious for their metal brackets catching the inside of the cheek or lip. With metal braces, you have to skip a lot of your favorite foods like popcorn, candy, or anything sticky or hard to chew. Since the aligning trays are removeable, you can eat whatever you want! Just be sure to rinse out your mouth and the aligners each time you remove them. Overall, Invisalign treatment takes a shorter amount of time to work its straightening magic compared to traditional braces. Some patients with metal braces must wear them for years and years. Invisalign aligners typically take from a year to a year in a half to achieve proper alignment. Now that you know the CLEAR advantages Invisalign aligners have over braces, talk to your local dentist to get started on your straightened smile! Dr. J.D. Robison has extensive training in providing Invisalign treatment to his patients. He believes in personalized care, so he gets to know each patient to give them the best results possible. He currently runs his own practice where he can be contacted through his website or by phone at (734) 453-6320 for any questions. Comments Off on Invisalign in Canton Can Straighten Your Teeth Discreetly!